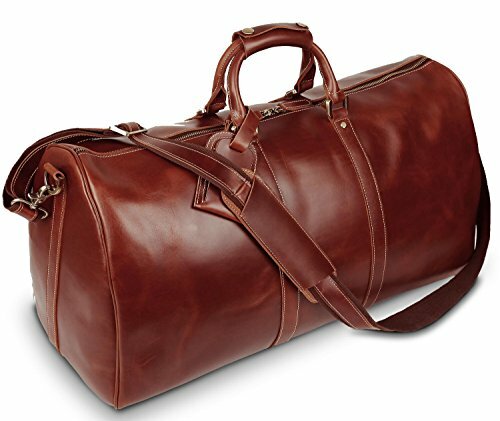 BAIGIO Travel Collection was designed for the frequent traveler-A classic jetset piece, resilient, in the natural leather texture. Perfect for a weekend away, the Large Weekender is streamlined and easy to carry featuring two top handles along with a detachable adjustable strap. Top zip closure for easy access, luggage tag, interior zip pocket and smooth leather trim. 1. The product is made from genuine leather so it has new leather aroma. You can open the package and put it in a ventilate place, the smell will fade away in a few hours. 3. Please confirm the size according to description instead of the photos. 4. Alcohol and oily substances, such as perfumes or cosmetic products, may damage or contaminate the product.